Set the pumpkin and orange on the cutting board. Slice the tops and ends off each. For stability, for support. Use a sharp knife and cut downwards. Revealing the flesh. Be bold, be precise. Peel away the skin,the membrane, the rind. Let the curves of the fruit guide your way. Mama, pumpkin is really a fruit because it has seeds. But we can pretend it’s a vegetable if you want. Should we pretend, mama? Pretend your last Mehregan wish echoed up through the hills and beyond the valleys. Pretend she took heed of your murmurs, your whispers, and your cries. And the sky burst at the seams with a thundering bang and a rollicking roll. Like the heart of young lovers on a hillside under California stars. Every strike of lightening peeling away the skin, the membrane, the rind. Revealing the flesh. The curtain pulling back and revealing her. The naked sky. Drip, drip, dripping with rain. Cut the pumpkin in half and reach in for the seeds The stringy pulp refusing to let go. Pretend you enjoy the mess of it all. Hold a fistful of pumpkin seeds in one hand. You should make use of it all. Don’t waste anything. Use everything. Watch them drop into the compost bin. Think about how you could have rinsed them, dried them and roasted them. But not today. Maybe another day. There will always be another day. Pretend a cool Autumn’s breeze invites herself in. And stays for a good long while. A much welcome, unexpected guest. She runs her fingers through your hair and whispers sweet nothings in your ear. Release the orange segments into a bowl. Cool and slithery, slippery. Bathing in orange blossom water. Juices and all slipping freely though your fingers. Wash your hands and peer out your sink window. Pretend the leaves have turned. Rust, amber, strawberry blonde. Slice the pumpkin and dress it up for Mehregan. 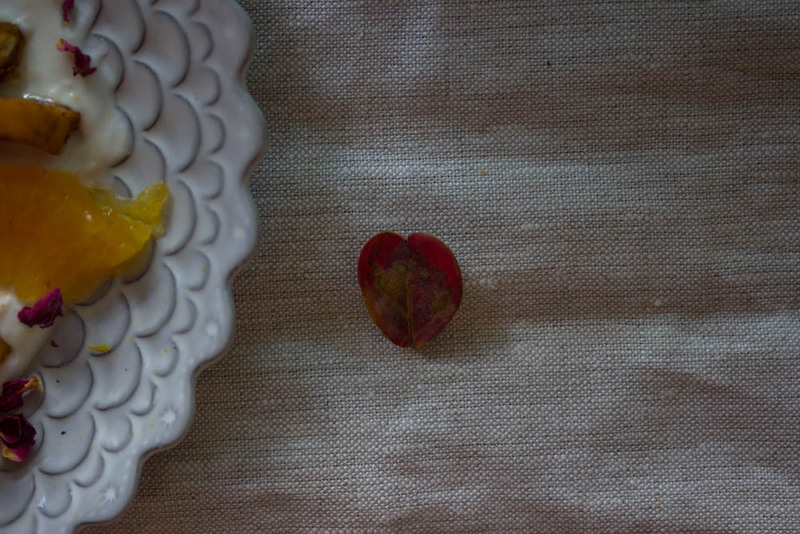 The Autumn Festival. Pretend you relish the warmth exuding from your oven as the scent of cinnamon, cardamom, nutmeg, cloves, ginger and cumin waltz around your kitchen. An Autumn Waltz. A prelude to a celebration of friendship, light, love, and compassion. Spread the cool, thick yogurt over the roasted pumpkin, add the orange slices, juices and all. Sprinkle all over with pumpkin seeds and sweet medjool dates. Rust, amber, strawberry blonde. A sweet pumpkin borani. For comfort. For Mehregan. For when you need to pretend it’s Autumn under California skies. I’m thrilled to be once again joining the following Persian food bloggers for a collaborative Mehregan post. Enjoy! I’ve really been enjoying this borani for breakfast. But, it also makes a great side dish accompanying any meal. I think it would be particularly festive at a Thanksgiving table. I’ve layered the roasted pumpkin and orange segments over the yogurt in the photos, which makes for a pretty presentation. But feel free to chop up the pumpkin in about 1 1/2 inch cubes and mix everything up with the yogurt. Here’s a great guide to segmenting citrus. I also prefer this borani as is, but if you would prefer it more sweet go ahead and drizzle with extra maple syrup when serving. Just keep in mind the dates sweeten things up quite a bit. This is a great “transitional” dish. When we say goodbye to summer and welcome fall. Or in our case in Los Angeles when we’d like to pretend to do so. Heat the oven to 375F. Oven rack in the upper 1/3 position. Toast the pumpkin seeds in a small pan over medium heat. Stir often (and never leave them out of your sight, they can burn very quickly!) until they release their oils and fragrance, about 5 minutes. Set them aside to cool. Place the yogurt in a medium sized bowl and zest the orange over the yogurt. Stir to combine and put the yogurt in the fridge until ready to use. Peel and segment the orange making sure you catch all the juices in a small bowl. Add the orange blossom water. Gently stir, cover and place in the fridge until ready to use. 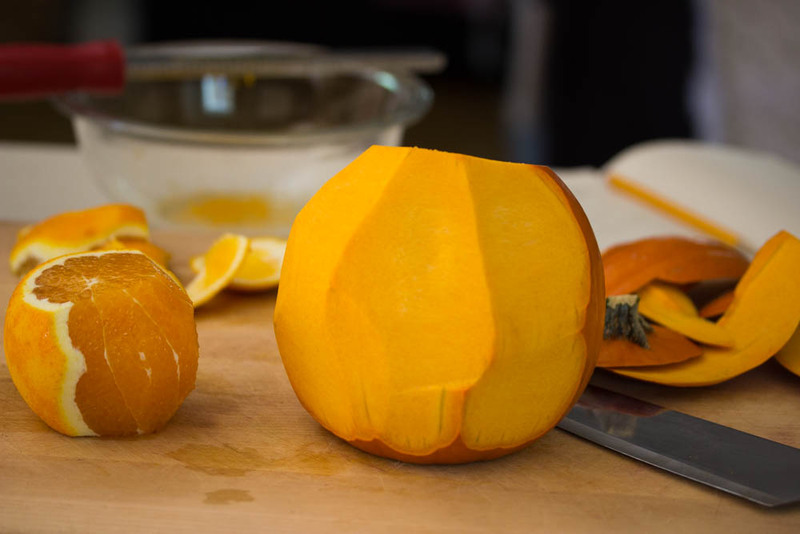 Peel the pumpkin (as you did the orange) and discard the seeds and pulp. (You can roast the pumpkin seeds if you’re in the mood) Cut the pumpkin in 1 inch slices or chop up the pumpkin in about 1 1/2 inch cubes. This depends on how you would like to serve it. 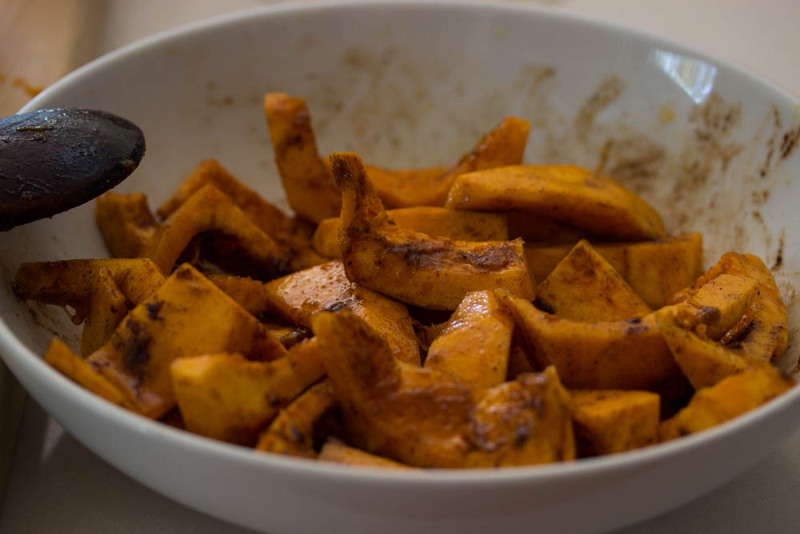 Place the pumpkin in a big bowl and add the ghee or olive oil, the maple syrup and vanilla. Stir to combine. In a small bowl combine the salt and all the spices. Sprinkle over the pumpkin, stir to combine. 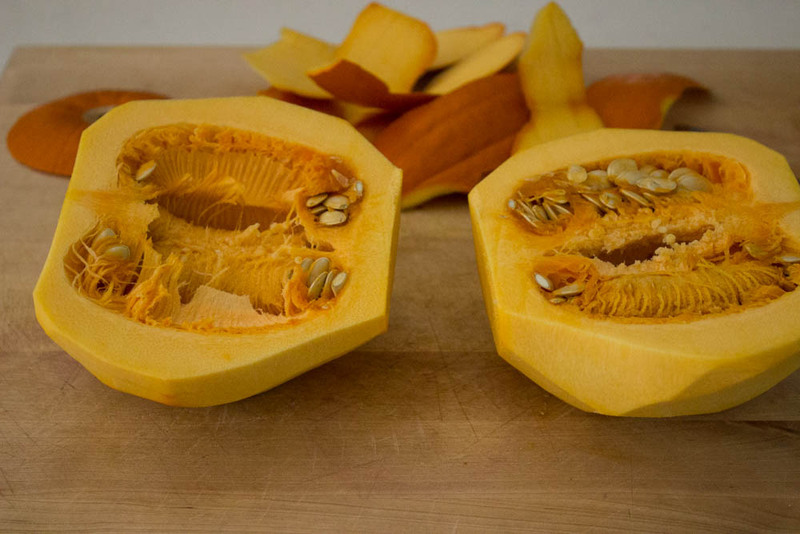 Transfer the pumpkin to the baking sheet and roast for 20 minutes. Tossing once halfway through. Allow the pumpkin to cool slightly. 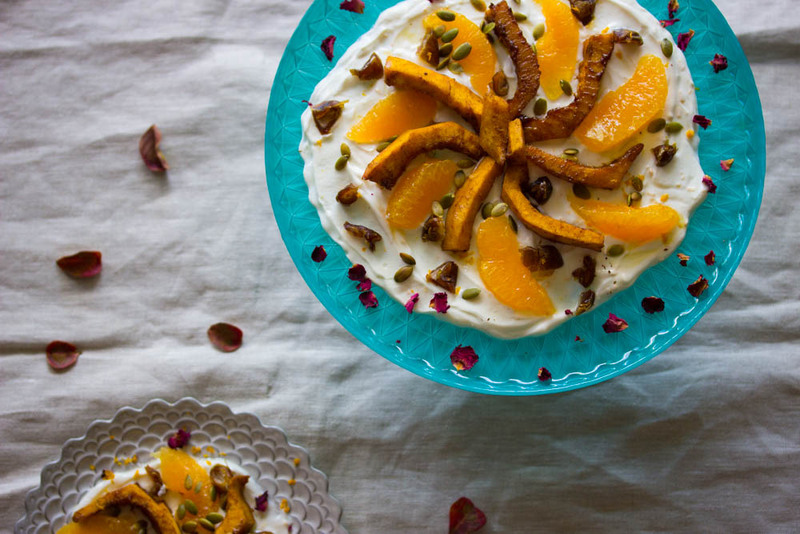 When cooled combine with the yogurt, orange segments and juices, pumpkin seeds and dates. Drizzle with extra maple syrup if desired. Serve immediately. 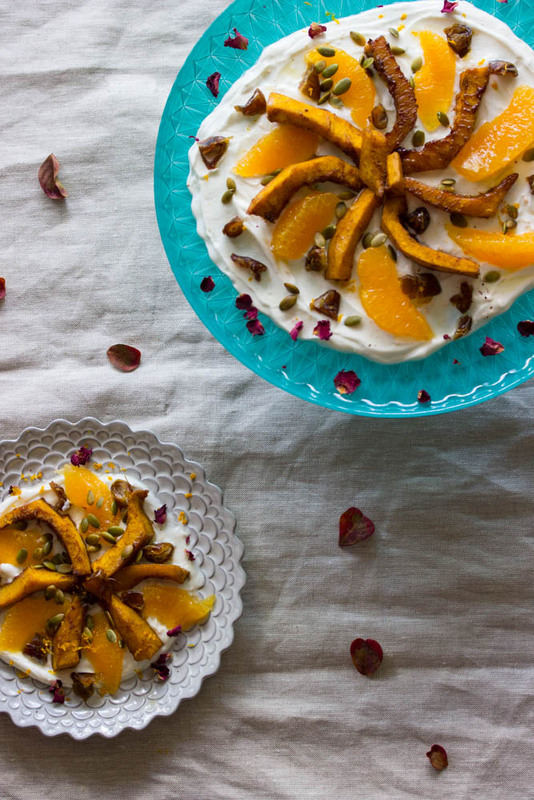 For a prettier presentation you can spread the yogurt over a platter and layer all ingredients on top. The borani will keep in the fridge for up to 3 days. Oooh, pumpkin and yogurt. I never would have thought of this. What a lovely post and recipe! I never get tired of reading your beautiful words & recipes…They just take me away. I love your creativity in both words & using ingredients. Thank you so much for sharing them with us & Happy Mehregan. What a beautiful post, Naz Joon!! I'm loving all the fall flavors here. So perfect for Mehregan! Naz joon, Loved the combination, I would never dream of combining the two. just made this with last night's leftover roasted spaghetti squash. yum! so fragrant, and such beautiful flavors. next time, i think i might add piaz dagh! Mahroo jan, thank you so much for your sweet words, as always! Thank you so much, Homa jan! Thank you, Laura! It's actually a really great combo! Bita joon, thank you! Hope you get a chance to try this! Fariba joon, as usual I'm late replying but thank you! And how nice is it to finally have some cooler weather! Thank you, Fae jan. Hope you get a chance to try it! Happy to meet you here! Thank you! Oooh, Tannaz what a great idea to try it spaghetti squash. Personally, I could never get behind the whole let's pretend spaghetti squash is actually spaghetti thing. But I bet it's really good prepared this way. And a double yes to adding piaz dagh!